7 Quick Takes — NFP, 10000 steps, and St. Anne [vol. 5] | Pray. Work. Motherhood. Gained a few more readers this week — welcome to our little sharing space! As I do every Friday, I’m jotting down seven little things that have been on my mind and/or things I’d like to share with y’all. If you blog, be sure to join the linkup over at Conversion Diary! 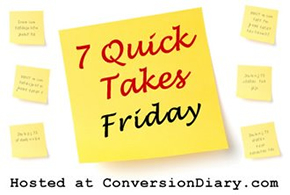 If you don’t blog, visit Conversion Diary anyway and enjoy other bloggers’ 7QT! 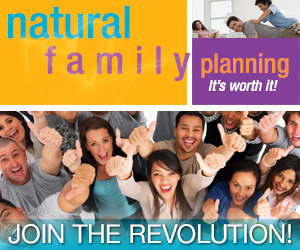 Next week, July 20-26, is NFP Awareness Week! What are you doing to celebrate? Not sure how to get involved? The USCCB has some great ideas here. I actually printed this reflection on Humanae Vitae out and gave it to a coworker this week when I was asked why Catholics “don’t believe in birth control.” It took a lot of courage, and I mayormaynot have left it on her desk and ran, but I did it! People are curious, and we never have a shortage of opportunities to share this beautiful teaching of the Faith. There are also some great NFP resources and fun stuff at iusenfp. Join the Revolution! In April of this year, I made a commitment to myself that I would set a goal to lose 100 pounds by my 30th birthday. My reasons to lose weight are myriad, but the #1 motivation is to get healthy. I call this endeavor my #100by30 campaign. So far, I’m 14 pounds lighter. Pray for me, please, that I might persevere? For my birthday, my parents gave me a Fitbit Flex to help me reach my #100by30 goal. Since I work in an office with very little opportunity in my schedule or physical space to do much walking, my work days are mostly sedenetary. Enter my FitBit and the daunting challenge of meeting my pre-determined goal of 10,000 steps a day. It wasn’t until I strapped the contraption on my wrist that I realized just how sedentary my daily life is. So, though I’ve had the FitBit for six weeks now, and through a long process of trying to add steps in every part of my day when possible, I reached my 10k step goal not once, but TWICE this week. I am thrilled! Several coworkers have FitBits, too, so we all do a great job of keeping each other accountable. If you’re interested and want to know more about the FitBit, Elizabeth wrote a great post with plenty of details that should answer a lot of your questions. I also started the Couch to 5k running program this week, with the hopes of running in my first 5k with my aunt this November. I completed Workout 1 yesterday. The creators of the program say it will take the average person 9 weeks to train — I’m going out on a limb and saying it will take me at least 11 😉 So excited! Thanks in part to the software interface of the FitBit, I’ve been keeping better track of my water intake each day. As it turns out, I was not drinking near what I should have been, and I’ve improved a lot in this area since becoming I was there I was basically perpetually dehydrated. One of the things that has helped? Drinking water through a straw. A few years ago, I noticed that I drink beverages much faster if I have a straw in them than if there was no straw. So, I make sure that when drinking water, I have a straw, even if I have to stick one in a water bottle. I told a coworker about it and she tried it, and she discovered this was true for her as well. I’m interested in your feedback on this – do you drink a great quantity of beverages, or drink them faster, if you drink them through a straw? At the Instagrammed suggestion of Cate over at Dainty Cate, I have begun downloading and thoroughly enjoying the Read Aloud Revival podcasts about the benefits and importance of reading aloud to your children. Sarah McKenzie of Amongst Lovely Things is doing an amazing job of bringing in guest speakers that really inspire and motivate those parents who might be a bit hesitant to read aloud, and she examines topics that will help you and your child become more engaged in your reading time together. You don’t have to be a parent to learn something here – grandparents, aunts and uncles, cousins, friends, neighbors – anyone with a child in their lives will learn a little something. I am still in the beginning of the series, but can’t wait to get to “Episode 6: How to Teach Your Children Shakespeare.” As you may recall, this is the “Summer of the Book” at our house, so these podcasts are a welcome enhancement of our reading intensive over the school break. I encourage you to check out these great recordings and tell me what you think! Today is the first day of the St. Anne Novena. If you’d like to join us, be sure to check out Pray More Novenas and sign up for daily emails that contain each day’s assigned prayers. In light of the terrible tragedy yesterday when a Malaysian Airlines flight was shot down over Ukraine, will you join me in praying this novena specifically for the souls of the victims and the families they left behind? Good job on hitting the 10,000 steps a day! It is a lot harder than people think it is. Yes, yes, yes to the straw. I am not sure why. I discovered it when I was pregnant and so sick, it just makes it go down easier and faster. I am also really enjoying the Read Aloud Revival Podcasts – they have so many fun ideas and Sarah is just fun to listen to. I must be living under a rock; I had no idea next week was NFP Awareness Week! I will have to read that reflection. Thanks for sharing! Congratulations on losing 14 pounds so far! I know you’ll reach your goal. I did a Couch to 5K program last year and loved it. I was never a runner, so when I finally was able to run for 30 minutes straight it felt like such a huge victory! You’ll be so proud of yourself, as you should be. If you’re looking for a support system during your journey, I highly recommend looking into “Tone It Up”. It’s a brand created by 2 girls who started by making free fitness videos on YouTube and have now created a huge community of supportive women. There’s women of all levels of fitness following along and it’s just wonderful! Those podcasts are so fun. I can’t wait for a new one to come out. Until then I’m trying out some podcasts from the Circe Institute. There is an interview with Dr. Kreeft that I’m working towards. Also, I totally agree on the straw thing. When I was first learning to drink green smoothies, I discovered that using a straw and having them very cold were the secret to downing then until I got used to the taste! Good luck with the C25K challenge. I enjoyed that app. I might just start up again. I’ve really fallen off the exercise wagon this summer, and it’s great for making steady progress!